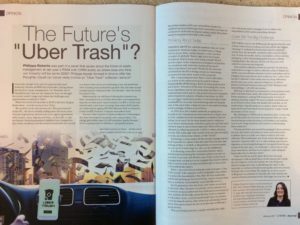 I wrote an article back in early December for the CIWM Journal, my professional association’s magazine. I wrote about what I think will be the future of waste management, looking forward to 2030 and what the sector will look like. Interestingly I don’t think I came up with a title for the piece, so when it was published I saw that it was called: “The Future’s “Uber Trash””. I say interestingly, because it was after I wrote the article that I read about Rubicon Global. This is an American company that has been using tech to disrupt the waste industry in the USA. It basically connects customers with a local waste contractor with capacity, thereby reducing the cost of collection. The contractors seem to love it because there are two big dominant players that they can’t compete with otherwise. And investors clearly love it as the company is now valued at $800m, with an estimated revenue of $300m last year. Rubicon’s last funding round was led by Suez, which means that they will be bringing the model to Europe. Looks like that was one prediction I got right! What about the others? What do you think the future looks like?